This week, we had Andrea from Italy and returning angler George from Panama for a day of offshore sport fishing for Fat Tunas. Andrea was looking for someone to share the expenses, so I contacted George who has fished with us on numerous occasions and is always ready to wet a hook on every possible occasion. It didn’t take long to hook these two up for an awesome July day of fishing. Both George and Andrea were interested in a big Yellowfin Tunas or whatever else was the productive Gulf of Chiriquí would offer. and the typical trash swept out to sea from the rivers all along the coast.These have been holding Dorado and other species, so we kept a watchful eye out for them when running. After picking up our Blue Runners and Bonitos for the Tuna Tubes, we encountered small Yellowfin Tunas crashing on sardines just west of Isla Montuosa. We quickly threw out two live Blue Runners that got slammed right away. 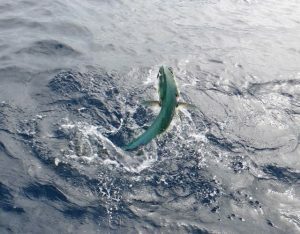 It didn’t take long for the mystery fish to reveal themselves as two beautiful Dorado went into their acrobatic dance. 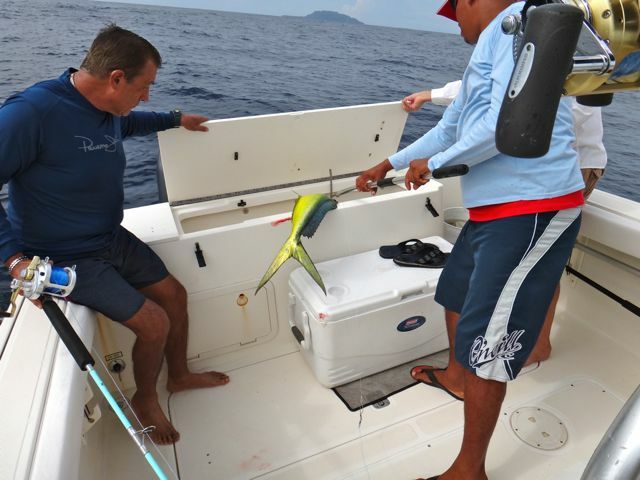 Andrea and George quickly brought the Dorados boat side, with George’s going straight into the box but Andreas’ spitting the hook. Not much was made of the lost fish since these two were really after giant Tunas. We pointed the “Sweet Leilani” towards Hannibal Bank and after a short ride, we arrived. We set out our spread of 3 lives baits and started our slow troll, working our way around the commercial fishing boats that were anchored. About 45 minutes later, one of the reels screamed and George took charge. After a great fight, the beautiful Yellowfin came close enough for a perfect gaff shot and hauled into the boat. We continued our slow troll, and after about 30 minutes of so, Andrea was on to another big fish. Andrea fought his fish like the old pro that he is and had the Yellowfin boat side in no time. After a few photos, we set out our baits once again and continued our search for about 90 minutes without another hit. With our day winding down and a long run back to Boca Chica ahead of us, we left the Bank. As we cruised home, we kept a vigil for some bird or porpoise activity, but found none. As I looked back at George and Andrea, both were gleaming with pride having each caught Fat Tunas. 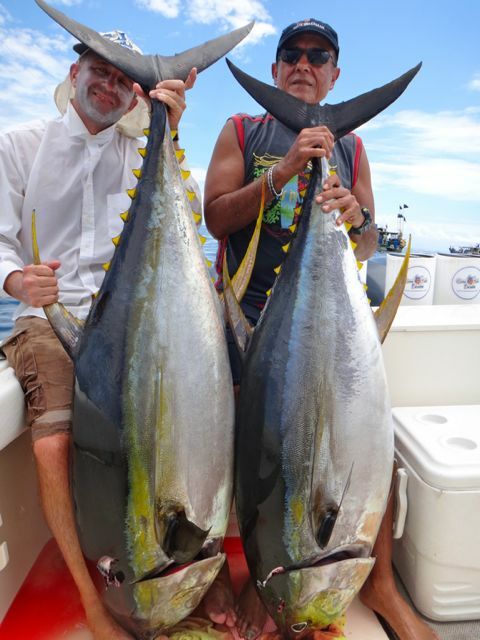 As always, we would like to thank Andreas and George for trusting Come Fish Panama with their offshore fishing adventure. They are both extremely skilled anglers and great guys to be with, and we look forward to their return in the future. From our family to theirs, we wish them well. George bending a morning rod! !